Under the guidance of new hall of fame defensive line coach Jason Taylor, Bonnito seems to have taken his game to a whole new level. Coach Taylor has been a phenomenal attribute to the defensive line as whole and we are just blessed to have guys like him within our organization, commented Head Coach Roger Harriott. 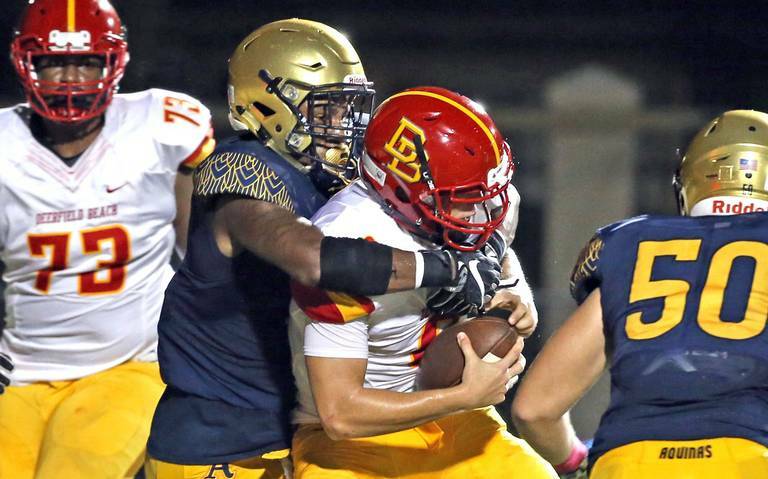 Two of the best defenses in South Florida were evenly matched for much of the game. In a span of two minutes, before the first half ended, the momentum shifted in Aquinas’s favor. The Bucks attempted a screen pass that Bonnito easily tapped to himself for an interception that led to the Raiders first score of the game. The effortless pick six seemed to inspire the St. Thomas defense. “It gave them a lot of confidence, lot of smiles on the sideline, it was good to see,” said Bonnito. On the ensuing Buks’ possession the Raiders stifled the Deerfield offense with two sacks and forced another punt. St. Thomas started their drive with great field position just outside the red zone. Junior running back, Daniel Carter, muscled his way past the goal line from 5 yards to score Aquinas’s second touchdown. This is all the Raiders would need as they would shut down the Bucks offense for the rest of the game. In the fourth quarter, Bonnito cemented the victory with a strip sack that the Raiders would recover. The 6’4 225 pound Bonnito has visits scheduled for Texas and Oklahoma but teammates are hinting that he will commit to the University of Miami. St. Thomas will look to continue its defensive dominance and generate some offense against Fort Lauderdale High School next week at home. Deerfield will look to regroup as they take on Stoneman Douglas next Saturday.